What’s In The Crockpot? Part Five | Keep It Up, David! Just because I haven’t published any “What’s In The Crockpot?” posts doesn’t mean that my crockpot has gone unused. I made a perfectly mediocre vegetable and bean stew in it just the other day. But because it was just mediocre (at best), and the internet is already flooded with mediocre recipes (just google Sandra Lee if you need proof), I refrained from blogging about it. OK, Enough chit-chat. Pull up your socks and lace up your sneakers, because it’s time to play! 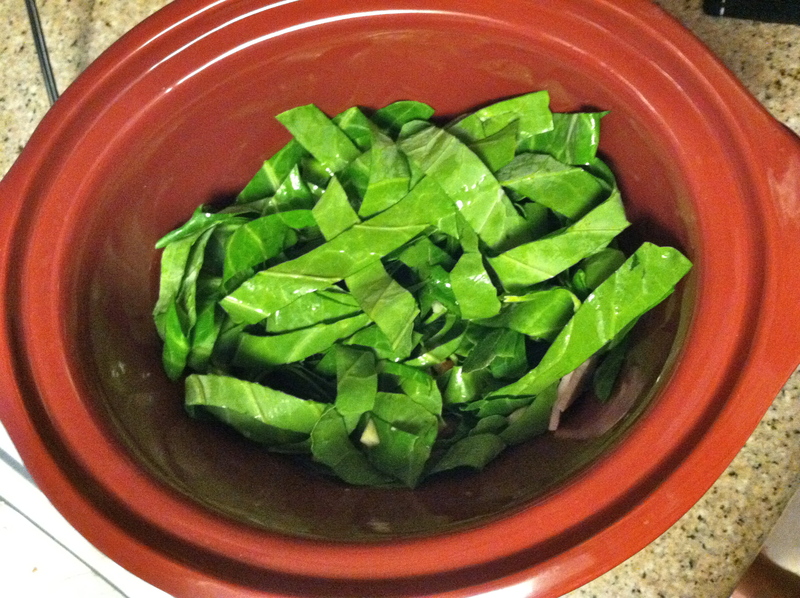 COLLARD GREENS are in the Crockpot! Before we get to the recipe, did you notice my hand-crafted crockpot handle in that first picture? 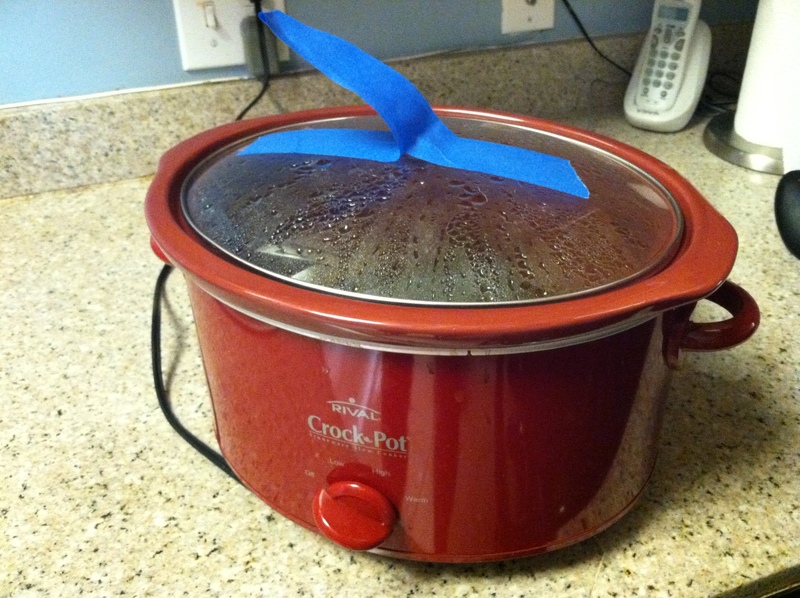 My crockpot lid handle broke off last fall (I blogged about it here), but I fixed it with some epoxy that I had. Then it broke again, more recently, but this time it wasn’t a clean break, making it harder to reattach with glue or epoxy. So, instead, I’m making handles out of blue painter’s tape. Maybe I should ask Santa for a new crockpot this coming Christmas. Maybe he’ll bring me a fancy-pants one with a built-in timer! Sigh… a boy can dream! 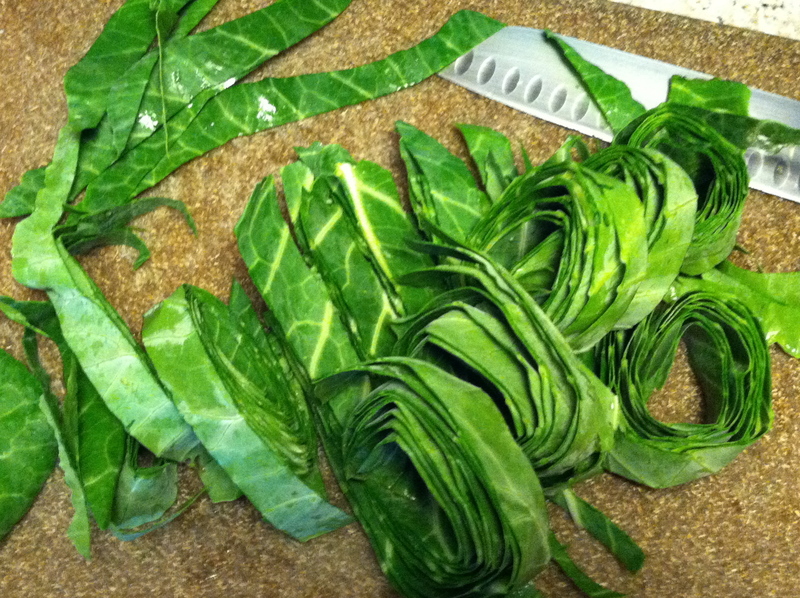 On to the collard greens. 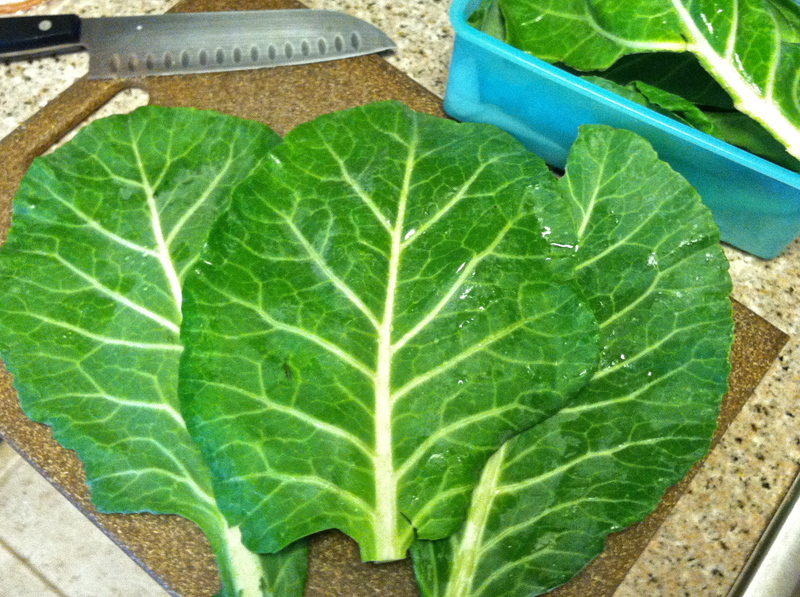 As I mentioned in my most recent produce haul post, I’ve never bought collard greens before. I’ve only eaten them a few times in my life, and the first occasion, if I’m remembering correctly, was in 2002 or 2003, after I moved to California. I’m a Midwestern boy, and you don’t see collard greens that much up in that part of the country – in fact, until the other day when I start manhandling them at the supermarket, I woudn’t have been able to identify collard greens if you slapped me in the face with them. 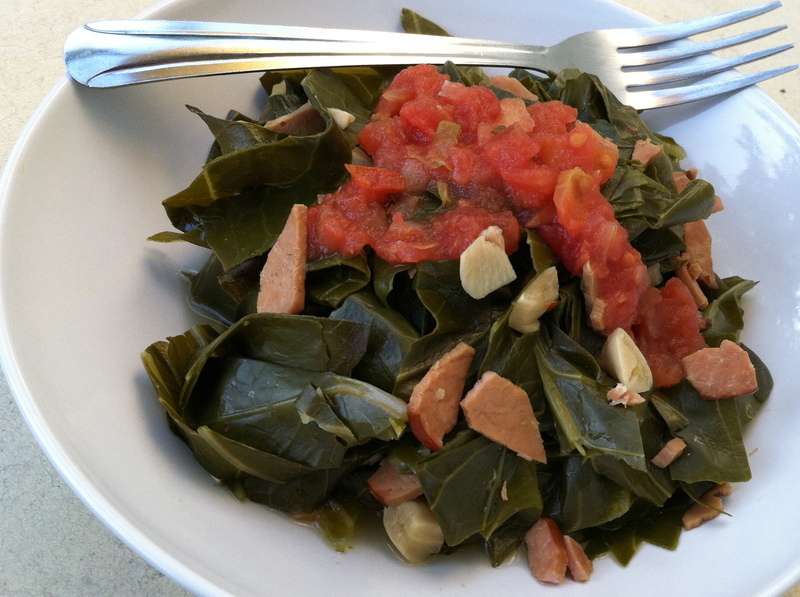 My knowledge of collard greens was very limited: I knew, like kale and spinach, that they’re very good for you, and I knew that you had to cook them. I also knew that they’re most commonly braised over low heat, so I thought they’d be a great ingredient for some crockpot cookin’. 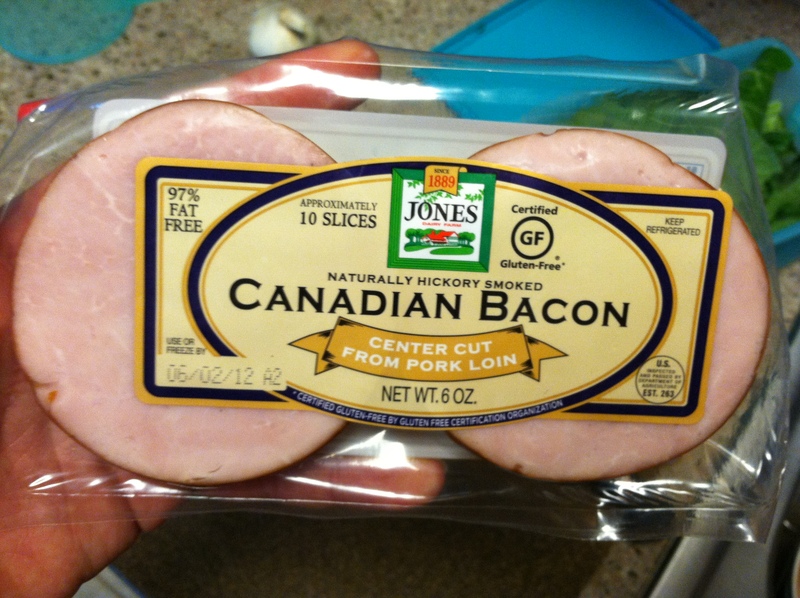 …CANADIAN BACON! 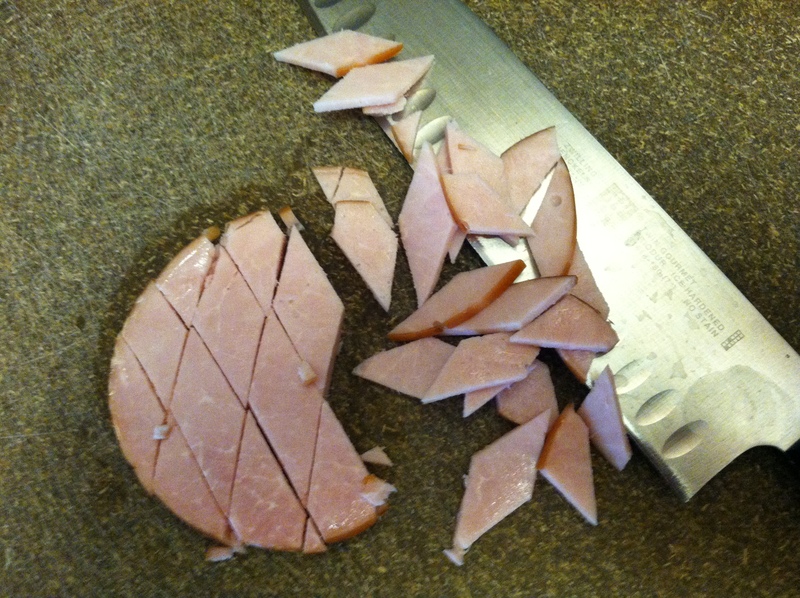 Canadian bacon has become my go-to product when I’m in the mood for a breakfast meat. It’s really lean and healthy, especially compared to sausage and bacon: a serving of Canadian bacon has 60 calories and 1.5 grams of fat. And I like that it’s smoky, and the perfect size for when I make breakfast sandwiches using English muffins. I also have a lot of garlic right now, so I thought I’d invite some garlic to the party. 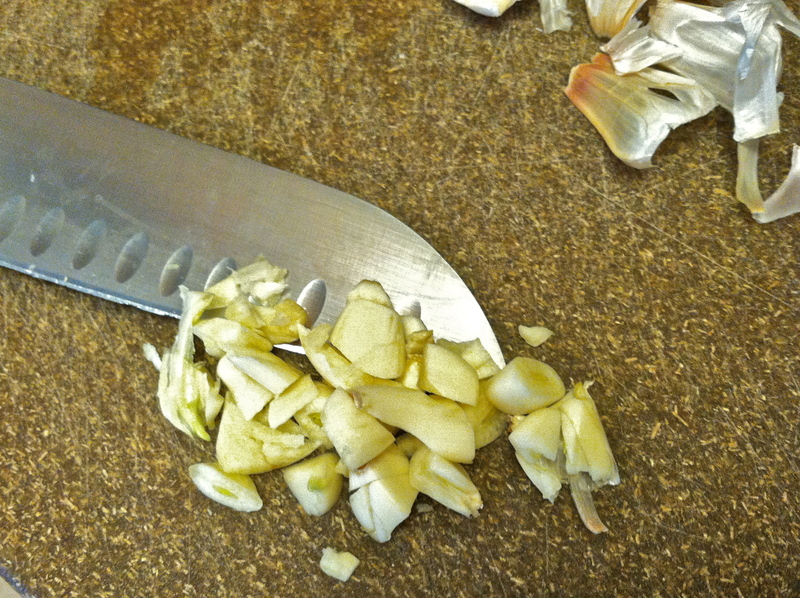 I used 5 or 6 cloves, and roughly chopped them. That may seem like a lot of garlic, but it’s been my experience that garlic gets really mellow and mild after hours in a crockpot, so I usually add a little more than normal. DELICIOUS! Garlicky, a little smoky, and fantastic. I’m sure had I used a fattier meat, the whole dish would have been even smokier and meatier, since it’s the fat in meat that has all the flavor, but I stand by my healthy swap – there was enough Canadian bacon to get a piece in every bite. 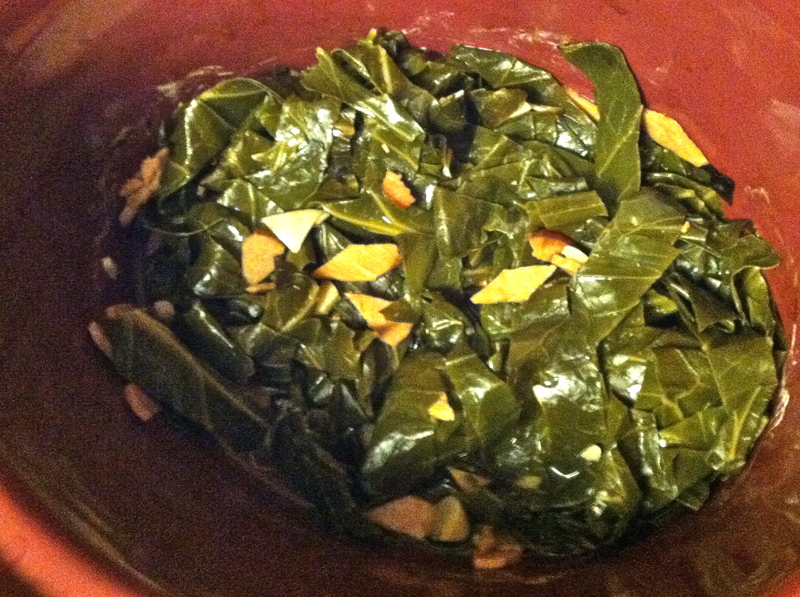 That bowl, by the way, has the entire contents of the crockpot – collards, like any cooked green, wilt down significantly. I should have said at the beginning that this was a recipe for one – and you’ll have to double, triple, or quadruple everything if you’re cooking for more than one person. 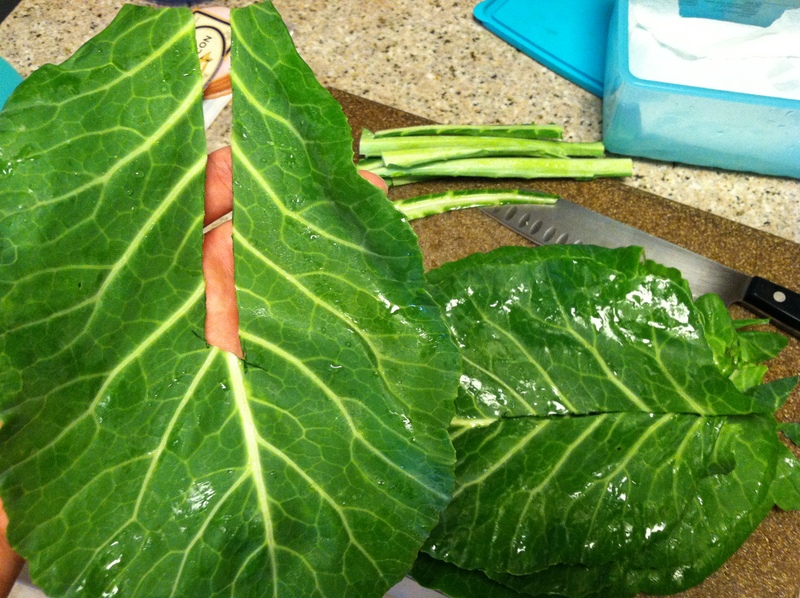 OK, Southerners – what should I do different next time I buy collard greens? And think healthy… I won’t be adding a ton of butter or oil! A couple recipes I saw suggested hot sauce as an ingredient or garnish… that might be worth a shot! This entry was posted on Monday, May 21st, 2012 at 2:30 am and is filed under Uncategorized. You can follow any responses to this entry through the RSS 2.0 feed. You can leave a response, or trackback from your own site. add brown sugar and balsamic vinegar while cooking. YUMMO! I’m going to have to try that. It looks easy, tasty and healthy. Great combo! I hope you do try it – and let me know what you think! Looks good! I have some in the crockpot now and am looking forward to indulging in my garlicky (3 cloves, chopped) green goodness! I usually cook them down first on the stove but opted to just put them in the pot and see how it turned out this time. I do believe I’m a fan of this method (sans stove-cook-down). This Southern gal stumbled as I read your addition of salsa (gasp!) to the dish, but if it worked well for you…go for it. Perhaps, next time, slice a nice firm tomato & maybe some sliced onion and eat along with it. I usually use smoked turkey wings and let it cook in the crock pot ahead of time and get nice & teeeender! Good home-made chicken stock instead of water for cooking – then add some red wine. Top it with balsamic vinegar when you serve it. I’ve also thrown a ham bone in with the greens & separated cooked greens from liquid, then used a fat separator before serving the recombined liquid (pot likker) and collards. Try having a cup of the liquid by itself – yum! Congrats on your weight drop! I went from ~300 to about ~180 in ’03. I’m about 200 now and maintenance has been the key.